The Pope's butler has been charged in connection with the Vatican's inquiry into a series of media leaks. Vatican magistrates have named 46-year-old Paolo Gabriele as the suspect in their investigation, saying he illegally took confidential documents. A series of leaks, dubbed Vatileaks, has revealed alleged corruption, mismanagement and internal conflicts. Last month, Pope Benedict XVI set up a special commission of cardinals to find the source of the confidential memos. Mr Gabriele is the pope's personal butler and assistant and one of very few laymen to have access to the Pope's private apartments. He lives with his wife and three children in an apartment within the Vatican walls, where Italian media report that a stash of confidential documents had been discovered. "I confirm that the person detained on Wednesday for illegal possession of private documents is Mr Paolo Gabriele, who remains in detention," the spokesman for the Holy See, Father Federico Lombardi said, according to Italy's state broadcaster, Rai. The Vatican's judge, Piero Antonio Bonnet, has been instructed to examine the evidence of the case and to decide whether there is sufficient material to proceed to trial. 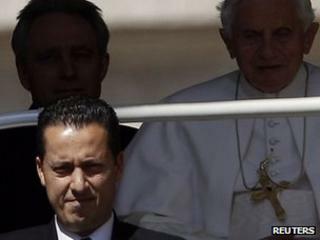 Mr Gabriele has nominated two lawyers capable of representing him at a Vatican tribunal, and has met with them. He would, the Vatican has said, have "all the juridical guarantees foreseen by the criminal code of the State of Vatican City". As the Vatican has no jail, Mr Gabriele is being held in one of the three so-called "secure rooms" in the offices of the Vatican's tiny police force inside the walled city-state, Reuters reports. If convicted, he could face a sentence of up to 30 years for illegal possession of documents of a head of state, probably to be served in an Italian prison due to an agreement between Italy and the Vatican, Italian media report. The Vatileaks scandal has filled Italian media - dominating the columns of Italian newspapers and filling TV programmes and magazines. The detention comes during one of the most tumultuous weeks in recent history for the Vatican. Last week a book, entitled His Holiness, was published by an Italian journalist with reproductions of confidential letters and memos between the pope and his personal secretary. The Vatican called the book "criminal" and vowed to take legal action against the author, publisher, and whoever leaked the documents. Last Thursday, the president of the Vatican bank - Ettore Gotti Tedeschi - was ousted by the bank's board. Sources close to the investigation said he too had been found to have leaked documents, though the official reason for his departure was that he had failed to do his job. Mr Tedeschi himself said the move had been a punishment for his attempt to make the bank more open. The BBC's David Willey, in Rome, says the leak of a string of highly sensitive internal documents from inside the Vatican's Secretariat of State, including personal letters to Pope Benedict XVI, has been an evident embarrassment to the Pope, prompting the rare investigation. The leaked documents include a letter to Pope Benedict by the Vatican's current ambassador to Washington alleging cronyism, nepotism and corruption among the administrators of Vatican City. Others concern "poison pen" memos criticising Cardinal Tarcisio Bertone, the pope's number two, and the reporting of suspicious payments by the Vatican Bank.